I was delighted to note the NCERT ad in newspaper asking for suggestions to reduce school curriculum burden, emphasize learning over memorization, for all-round development of children. However, the feedback format, is still designated with current education protocols. In other words, feedback is solicited individually from 1st to 12th standard, and specific to 14 subjects. I am afraid that such an approach to requesting feedback, will be hard for anyone outside the teaching profession, especially when the Department of School Education & Literacy under MHRD is considering ideas for children’s overall development. It is like asking feedback to improve a car’s performance, without considering feedback to improve roads that are laden with potholes or other infrastructure to ensure safety. I use this analogy because revamping the Indian educational curriculum is a monumental task that requires a holistic approach. It cannot be limited to improving subjects alone. The success of implementing an overall development of children, belongs to MHRD first because it holds the accreditation powers to catalyst a revolutionary change in education. This is a dire need, and given the rampant advancements of Artificial Intelligence (AI) & Automation, even teachers and parents will have an important role to play to cement career prospects of our children. It is a sad state of affair – or ignorance perhaps – when parents think that their children’s future is secure because they managed to get admissions in schools or colleges – including high fee payments. However, I feel that the current education system prepares kids for the future in the same way a horse is trained to pull carriages in the year 2018 when cars can be utilised instead. By no means is my intention is to hurt sentiments of parents by comparing our kids to horses. But I can’t find a better analogy to justify our outdated education curriculum. For example, we still prioritize memorization over knowledge application. We do not have horse carriages as we did a century ago – but our education system is status quo. Words can’t do justice to emphasize how critical it is for everyone to take part in cementing our children’s career. I use the word “critical” because Artificial Intelligence (AI) and Automation has already started affecting the careers of blue and white collar positions. Let me reiterate that again: It has already begun and NOT something that is going to happen. AI should be a concern for anyone in the workforce who is 50 years of age or younger. If this is the case, then imagine the scale by which our children’s career will be impacted by technology. The future of jobs – what can be expected in the next couple of decades? Why knowledge application is more important than memorization? I outline these concepts to stress this important message: We don’t need an evolutionary approach to our educational curriculum, but rather, a REVOLUTIONARY approach. This is why I am not convinced with the feedback link in MHRD page because it still looks at improving education in conventional ways. As already mentioned, developments in automation and AI are disrupting both white and blue collar workforce. Unlike the industrial revolution where changes took place in decades, advancement of AI solutions replacing human workforce will happen in an exponential pace. Most people can’t fathom this rapid change until it affects their careers unexpectedly. This is best illustrated with an example. Blue-collar example: Brands like Nike and Adidas that make over half a billion shoes a year used outsource their manufacturing to developing countries to reduce production costs – especially labor. However, given the advancements in automation, these companies no longer require human workforce to manufacture shoes. Their net income is poised to increase by a big margin owing to faster production, minimized errors and elimination of human workforce. There are other advancements in AI & automation to replace blue-collar workforce that include agriculture, retail, restaurant services, FMCG, construction, etc . The important takeaway moving forward – be it developed or developing countries – is that there will be no more “job creations” in manufacturing sector. Those days are over. Innovative services, driven largely by technology entrepreneurship (Ola, Uber, Flipkart, Amazon, etc), is where the next wave of job creations can be expected. White-collar example: There are slew of AI healthcare start ups, so let us consider an example in medical imaging technology. These AI applications are diagnosing medical images on par with the best radiologists. Moving forward, a large hospital that hires 4-5 radiologist can just purchase an AI-enabled imaging diagnosis tool, and retain just 1 radiologist. One can now imagine how the human workforce will be reduced over time. There are AI disruptive tools for other white collar professions that include law, banking, financial services, logistics, real estate, human resource and education. Governments in some countries, are already discussing implementation of laws where companies hiring AI tools / robots will have to pay a “human-unemployment” tax, that will be used to provide basic income to people who are not employed. There will be no more full-time jobs in the coming years: Technology will start disrupting in many work environments where the human workforce will work with AI tools to achieve desired outcomes. Human workforce will become a subscription service: People will no longer be working at one company at a time. Given their specific skill sets – that machines can’t do – they will be hired by multiple companies for specific objectives. Assuming that an average human being can work 2000 hours a year, people will delegate their time slots to multiple companies. In other words, work will become a proactive affair by every individual, as opposed to reactive execution in the current scenario. The key take away from this section, is that those who perform work where more than 50% of what they do is repetitive, then they will be replaced by machines. In order to maintain the human edge in work environment, they have to do work that machines can’t do. Again, this is best expressed with an example. Many students in our mathematical curriculum learn differential equations in theory only, because they are tested on their ability memorize mathematical theorems. To this day, students don’t ask the purpose of learning differential equations. Even the teachers don’t express it. What is pathetic is that even our textbooks in high school and engineering, don’t mention a single line on the applications of differential equations. A friend of mine since college, was ashamed while confessing once, that he never understood the applications of differential equations, until he had to redesign the wings of a model airplane for vortex calculations. He expressed there are math modeling software now, where we need not memorize formulas anymore. We only need to apply our creativity in exploring different designs and the processing of thousands of data using differential equations are calculated within seconds by the software. The question to ask here is – Why still force our kids to memorize math formulas? Now imagine the plight of our children who are still in a curriculum that tests and grades memorization ability, while someone who is not even mathematically inclined, can learn the applications of differential equations for a specific requirement based on his project objective, and simply use software to get results. Therefore, our children are doomed into a situation what I call as ‘baseless theory overload.’ It’s like holding on to thousands of music vinyl records in a age where music is streamed for free on YouTube. With access to information at our fingertips, it’s about time we eliminate the protocols on testing students for memorization. The ideal solution – keeping advancements in AI & automation in mind – will ensure that children are trained in knowledge application. This will automatically happen when they are trained for skills and creativity. I propose these solutions and it is up to the education committee at MHRD to brainstorm and execute this to fruition. Life skills learning until age 10 – Children must be disciplined to learn life values and understand the framework of human interactions between the ages of 4 and 10. Activities such as music, arts & crafts, gardening, agriculture, sports, etc. must be inculcated. The Japanese education system have established protocols of inculcating these habits and activities, and we stand to gain a lot by adopting these methods for our children. Beyond age 10, emphasize creativity, knowledge and their applications – Every child is unique in the same sense that one can’t judge a fish by its ability to climb a tree. We should create a curriculum where children understand the significance of innovation, policies and technology and how they have impacted societies. Be it science, mathematics, history or economics, teachers should emphasize the purpose behind knowledge bestowed on students. By age 14, introduce children to mentor programs – Following the previous 2 steps, children will automatically recognize their area of interests, and to guide them appropriately in those paths, schools should implement student-mentor programs once a month. These mentors from industry will serve as career advisors and emphasize the significance of continuous learning. They will fill learning gaps that are beyond the purview of teachers. Mentorship is key to induce self-learning habits in children – be it knowledge or personality development. As I mentioned before, given the fast-paced technological progress, it is not only important to learn, but also unlearn and relearn, and mentorship will remain a strong foundation for continuous learning. Eliminate tests and grading systems – Memorization and testing must end. This can only be achieved if process such as ranking and grading is eliminated. Instead, students must be compelled to achieve something in their areas of interest – be in innovating a simple product or a service based on knowledge gained. For example, a student interested in mathematics can apply knowledge in statistics and probability to forecast needs of a particular business. Someone interested in playing a musical instrument should compose their own music tone. By shifting focus towards achievements, children will have a sense of pride and accomplishment, rather than having detrimental thoughts induced by comparing test grades with others. All these are starting points to revolutionize our educational system and it can be considered a level-1 plan. The MHRD can research the nitty-gritty details of my take on the future of jobs impacted by AI & automation. I am confident that by starting with solutions mentioned above, the MHRD can arrive at a better solution, in a manner that will improve overall learning for children. We know that knowledge is power. Having knowledge of how technology will evolve and impact careers is winning half the battle. Humanity has always survived challenges for centuries, thanks to our adaptable nature. Once we know what we will run into, we can take action to safeguard our children’s career. Get off the rat-race mentality: Do not pressurize your kids for grades and stop comparing them with other children’s performance. It is enough if they get decent grades to pass their subjects. We have discussed that the current system is oblivious to knowledge application. So please stop sending kids to additional coaching classes beyond school. This does nothing but enforce a slavish mindset in them and it is detrimental to their creativity. Avoid gadgets and inculcate reading habit: When they are about 3-6 years of age, spend time with them to share stories – be it fiction or non-fiction. When they are 7 and above, incentivize them to become voracious readers. Be it Amar Chithra Katha comics, fictional novels, puzzle solving books or science / math books, it will enable creativity and knowledge application. They also make children better communicators and analytic thinkers. Extra-curricular activities should involve one sport and one cultural activity: Cultural activities include learning in fine arts (music, dance, drama etc). This type of learning enables creative thinking. Sports will empower discipline, team work and relationship building in children. Essentially, these activities ensure that mind and body are in good spirit and health. And it is enough if these activities are limited to one each. Any more would be exhaustive for them. Volunteering for a social cause: For 1 day every three months, let your children volunteer their time for a social cause. These may not necessarily be limited to helping out at an orphanage or cleaning a park. It could also include volunteering their time at a local library, vegetable shop or the gym where you work out (provided the people designated there are your close associates). Your supervision at such events will enable social learning for your children and help them understand the fabric of society. The important point underlying the above points is this: A child’s success is determined by the magnitude of parent’s involvement in their lives. In other words, parents should spend quality time in nurturing their children’s overall development. The worst thing parents can do – by being busy in their work life – is remain in a state of denial that schooling will take care of their learning. I use the word “denial” because most parents are indeed aware of our outdated education system, since they can draw parallels on how much of their education is “genuinely” helping in their careers. 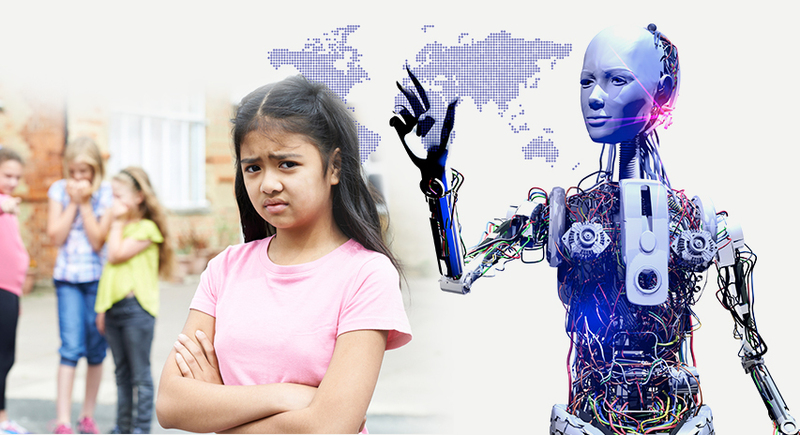 As Julius Caesar aptly said “The fault dear Brutus, lies not in our stars, but in ourselves.” It is about time that all parents took responsibility, and by ensuring these four points, they can empower their children’s career in sync with technological advancements. Fantastic article Shri. It is an eye-opener for a lot of us who are parents. I could not but agree with the solutions you have proposed. Holistic learning, emphasis on life skills, creativity and the freedom to explore and learn should be the way forward. As a practitioner of NLP, I am a firm believer of the presupposition which states “If you always do what you’ve always done, you always get what you’ve always got” and that cannot be truer of our education system today. Prospects after years of struggle and lost in time,money and purpose driven goal. the work environment very difficult to cope up. hour” to revamp our education system in order to sustain our future. I am very much impressed with the above article. Our Education system is ruining a child’s creativity.The methods given here are an ideal solution to revamp our education structure. Let us not make the future generation victims of the current system and take responsibility. It’s really a eye opener. The type of education must be changed at this hour… Other no Competence can be achieved.. Best wishes on your article. A well thought through article and is definitely the need of the hour. Very well written. Involvement in sports/extra curricular activities are very critical in shaping a child’s brain development and foster their creativity skills. As mentioned in the article, it’s the right time we change the system before it becomes too late.